Every Friday night a Venice crystal gallery is packed with people ready to unwind with Dynasty Electrik, a musical duo that combines their own compositions and performances with crystal singing bowls. If you’re looking for your New Age fix, this weekly event at Mystic Journey Crystal Gallery checks every box. Mystic Journey Crystals opened in July, and was founded Jeffrey Segal, who also founded Mystic Journey Bookstore on Abbot Kinney. While metaphysical books can be purchased at the latter, the gallery serves as a place to display large crystals and geodes. Guests can browse the crystals, as well as the rotating selection of art. On a recent Friday evening I strolled into the gallery about a half an hour before the sound bath was to begin. Even if you’re not a crystal person (I’m typically not) the pieces displayed here will catch your eye. They’re certainly some of the largest crystals I’ve ever seen, including a massive amethyst geode sourced from Uruguay, weighing 253 pounds and priced at $30,000. In the corner of this room, I noticed a woman identified as Kristen Marie offering a tarot card reading to a woman clad in a giraffe onesie. In an adjacent lobby, a man was handing out samples of a rootbeer elixir made with wild Chaga mushrooms via Black Magic Alchemy, which I was told would “sexify” one’s skin. I only had a small sample of the surprisingly sweet concoction, so can neither confirm nor deny this claim. As I sipped, people were strolling in with yoga mats strapped to their backs, storing their shoes in cubbies. I tossed my elixir cup, removed my own shoes, and soon made my way into a dimly lit hall. This was where the magic was to happen. Yoga mats and blankets were spread out on the wooden floor around a low stage where Seth Misterka, one half of Dynasty Electrik, played a dulcet melody on a flute. Behind him, a rotating LED projection light splashed the wall with pastel tones, while several large crystal singing bowls were spread before him. At our leisure we filtered in and chose our spots. Some of us covered up with blankets and stared up at the ceiling, while others chatted, waiting for the sound bath to begin. The giraffe finished her tarot reading and joined her friend, who wore the exact same outfit, only in a unicorn style. There were more attendees than the hall could fit, so some spilled out into the gallery. When it was time for the south bath to begin we got comfortable in our spots and room was dimmed until only the rotating light remained. Dynasty Electrik, comprised of Misterka and Jenny Deveau, has been performing as a duo for some 15 years. They formed in Brooklyn, and have reinvented themselves many times over the course of their musical history, sometimes veering into indie rock, free jazz, or electro rock, other times offering more meditative tunes such as those made specifically for the sound baths. Deveau said that they pair got into sound healing and sound baths after they were approached to provide compositions for a sound healer in Massachusetts. Notably, Deveau is also a creative director at Mystic Journey Crystals. One thing that sets apart Dynasty Electrik’s sound bath is that it blends pre-recorded tracks with live performances by the pair. The tracks consist of spacey synths and nature sounds both sampled and recorded by Misterka. On top of this, the pair may play gongs, the flute, or a theremin live. Combined with the clear, full hum the various bowls produce, it’s a lush soundscape. The wall of euphonic noise, combined with vibrations felt through the floor, acted like a cushion of sound around my head. It was almost, but not quite, too loud. I’m not a great meditator, as my thoughts are prone to drifting when I am relaxed. So, I found myself thinking about a variety of things, most of them tangential, akin when you’re lying in bed on the precipice of sleep, but not quite there. Someone near me did fall asleep, or so I could ascertain by their soft snoring. Throughout, Deveau occasionally walked around the room with a portable bowl, bringing the warm tones closer to our heads. 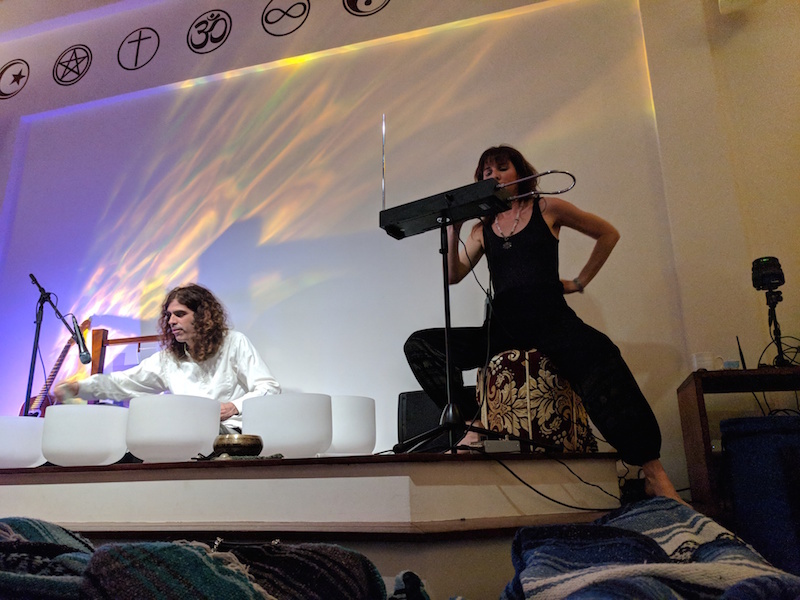 Towards the end of the sound bath, which ran for about 45 minutes, Deveau returned to the stage and sang the first and only vocal song of the evening. She played a theremin while Misterka strummed an acoustic guitar. Afterwards, we were invited to breathe in and out deeply, then collect ourselves at our own pace. I found myself surprisingly sleepy for several minutes, but soon perked up enough to chat with others. Now, I’m not much of a New Age sort. Crystals are pretty, yoga is fun, and I appreciate reiki and tarot more for their ability to trigger my ASMR than to offer guidance or cleansing. Yet I can appreciate a good soundscape, and I enjoyed the opportunity to just relax, close my eyes, and listen to something beautiful. But what do other people get out of it? Deveau confirmed that the weekly events have a solid group of regulars, using attracting about 50 guests a session. Some, she said, come for the healing properties they believe a sound bath offers. Many people simply use it for meditation. A few claim to experience synesthesia, and at least one guest views it as a means to speak with extraterrestrials. That actually isn’t so odd, or at least, it’s not the first time sound baths have been linked to alien communication. The Integatron, located near Joshua Tree, is renowned for its frequently sold out sound baths, which take place in the structure’s second floor dome. Its founder, aviator George Van Tassel, was transfixed with the idea of UFOs and their otherworldly passengers. Van Tassel claimed it was an alien who gave him design instructions for the Integatron, which purportedly has the ability to rejuvenate human cells. Van Tassel began building the Integatron in the 1950s and continued to work on it until his death in 1978. The current owners of the Integatron say that people still come from all over the world to experience the supposed healing and rejuvenating properties of a sound bath in the dome. But hey, it’s nice to know you don’t need to go all the way to JT to take in such a rich sound bath experience. Dynasty Electrik’s Crystal Sound Bath takes place every Friday (with rare exceptions) at 8 p.m. at Mystic Journey Crystals in Venice. Admission is $24, or free for members. Tickets can be purchased online. Other events at the gallery include yoga, meditation, and a sound healing workshop, also led by Misterka. 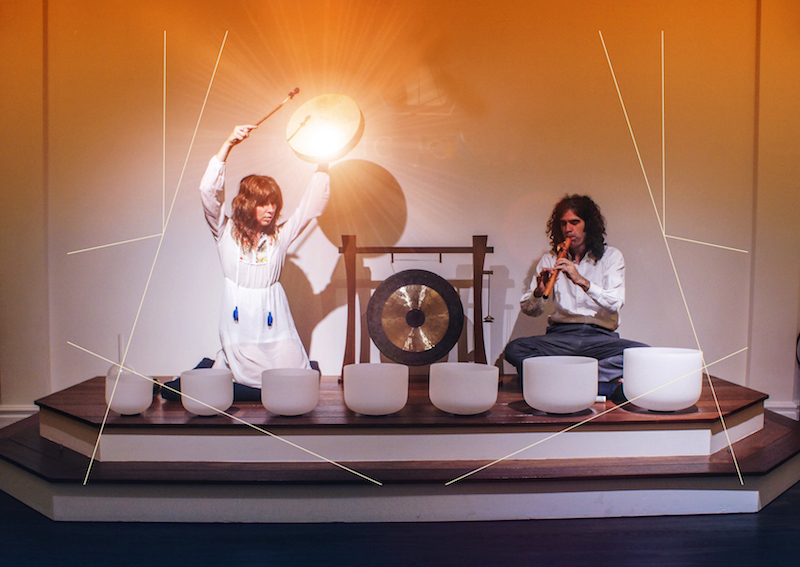 If you are interested in hearing the tracks used throughout the sound bath, they are available on Dynasty Electrik’s album, Crystal Sound Bath.